… that a Smart ride starts with “Smart” Accessories and Apparel. While the amazing new products shown here may seem like some futuristic fantasy, you’ll be shocked to learn that they are available NOW at Bob’s! Come in today, try them out, learn about the astounding ways these products can revolutionize the way you ride, and then get ready to BLAST OFF for a better-than-ever 2015 riding season! Heads-up display on faceshield showing GPS, all instrumentation, latest weather info, twitter feed, email, and more! Surround-sound music system with noise-cancelling “Concert Hall” acoustics and voice-activated, multi-function communications app that does everything you can imagine and more. Your old in-helmet intercom system just became a relic of the past. Built-in 360-degree camera captures full panoramic view. Voice activated commands allow you to post your trip videos in real time without even stopping to get off the bike! 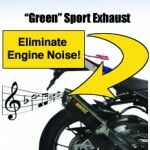 Totally eliminates any actual engine noise, but plays sound recordings that let you choose how you want your motor to sound. Adjust the volume to your preference – from a whisper to a roar. Better than a catalytic converter – removes all toxins and pollutants and actually converts remaining engine exhaust to 72% pure oxygen with the rest being a variety of inert harmless aromatics. 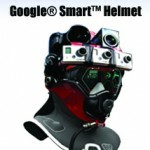 Bluetooth® connectivity directly to the Google® Smart™ Helmet allows you to monitor all functions on the go and, if desired, divert oxygen straight from the exhaust into the helmet for better-than-fresh air to breathe. and automatically adjusting the temperature to the perfect comfort setting. The chip is even programmed to cancel out false input that might occur when rider flatulence can momentarily spike the temperature readings. No one likes getting on their bike when the pegs are cold! Now you don’t have to. 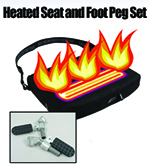 Heated footpegs included in this kit are also fully programmable to any of 12 comfort settings, and linked by Bluetooth® to the seat to assure compatible temperature combinations. As a bonus, choose the Reflexology option and you’ll also get 6 important pressure points on the bottom of your feet massaged while you ride. It’s not just about comfort. Studies have shown that when these pressure points are stimulated the neurological effect on the brain promotes balance and control in ways that can actually make you a better rider!